Oishei Children’s Hospital offers women the best and safest option for delivering their baby as the only hospital in Western New York with teams of maternal-fetal medicine physicians, pediatric surgeons and a full panel of pediatric medical subspecialists on site, including the region’s largest and most advanced Neonatal Intensive Care Unit (NICU). These services work in collaboration to care for both mom and baby, and are available 24/7 to respond to any urgent medical needs. These teams of experts are the only in Western New York Oishei Children’s Hospital that offer this multidisciplinary approach to care for high risk pregnancies and babies. Together, they determine the best care plan, and are available to be present at birth to help ensure the baby has the very best outcome possible. 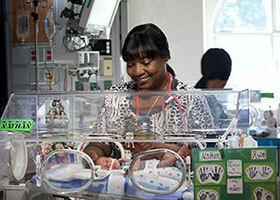 The 64-bed NICU admits more than 850 babies each year and has an average daily census of 50. Approximately one-third of admissions are transported from an outlying hospital by the active Neonatal Transport Team, readily available to provide stabilization and transport to Oishei Children’s Hospital for any infant in the region.